Yooralla can support your child's NDIS goals with our wide range of tailored, flexible and quality services. We are a disability specialist and we know the NDIS – we have been supporting participants from the beginning of the NDIS. We support people with disability of all ages and needs, and their carers, and have provided supports to people with disability since 1918. 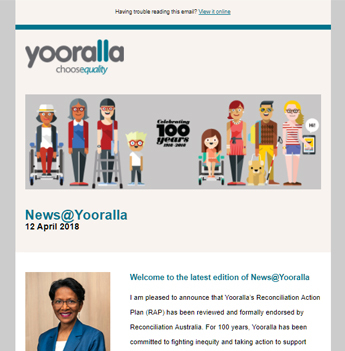 Yooralla has supported parents of children with disability for 100 years. Yooralla’s Specialist Children Supports support children with disability to improve communication or increase mobility and engagement in everyday activities. Our flexible and qualified team of therapists provide multidisciplinary support across a range of therapies including physiotherapy, occupational therapy, speech pathology and psychology. Yooralla are specialists in children’s early intervention supports and we provide specialist supports for people with high and complex needs. We have skilled, qualified staff and supports to meet all of your family’s needs. Yooralla provides tailored short-term accommodation (respite) experiences and the chance to take a break from the daily routine. We can provide support in your own home, or in our purpose-built respite accommodation. With options for all ages, all our accommodation is fully accessible, fitted with appropriate assistive technologies and supported by highly trained and qualified staff. We can support people with complex health requirements, and your child’s health and safety is our highest priority. Yooralla’s Communication and Assistive Technology team provides services that can enhance lifestyle, independence and communication ability by providing information about, and access to, assistive technologies and equipment. How can I find out if my child is on the autism spectrum? Yooralla provides autism tests to determine if children (over 2 and half years old) meet diagnostic criteria for Autism Spectrum Disorder (ASD). Our Autism Assessment Clinics are staffed by a multidisciplinary team of a clinical psychologists and speech pathologists. If your child gets an autism diagnosis, our staff can support you through the NDIS process, with comprehensive resources and free advice. Find out more about Yooralla’s supports for children with autism. Yooralla provides services for children with autism, recognising the importance of early intervention in building a child’s capacity through the early years, and then through school and beyond. This may be through a transdisciplinary model, where a key worker assists to coordinate the delivery of your services to ensure a smooth delivery of services. Therapy including speech pathology, physiotherapy, occupational therapy and psychology. Positive Behaviour Support, which focuses on increasing your child’s quality of life and decreasing the frequency and severity of their behaviour of concern. Assistance with Daily Living for support in the home or accessing community activities. Recreation activities, group activities or individual goals and pursuits; day activities, a weekend camp or a week away. Yooralla specialises in providing support to children and adults with disability displaying behaviour of concern. Built on an evidence-based approach, our Positive Behaviour Support team focuses on increasing your child’s quality of life and decreasing the frequency and severity of their behaviour of concern. Yooralla can help you to prepare for your child’s NDIS planning meeting in a free one-on-one session. You can also download Yooralla’s free guide to the NDIS for your child. Book in for a free one-on-one meeting with Yooralla once you receive your child's NDIS plan to make the most of it. Yooralla has also produced a free guide to the NDIS for your child which can help you to understand and implement your child’s NDIS plan and everything you need to do to make the most of the NDIS for your child. Yooralla’s Support Coordination service links adults and children with disability with the right providers to meet their needs. We support you to understand and implement your NDIS plan. Our multidisciplinary approach means we provide assistance to source providers, coordinate a range of supports, build on informal supports, resolve points of crisis, and develop resilience in your own network and community. Our team is comprised of people with extensive disability services training. Yooralla provides Assistance with Daily Living for children with disability. We provide one-on-one support, seven days a week, assisting your child to live the life they choose. This can cover getting ready for their day, getting out and about in the community, enjoying social activities, or getting to an appointment. Our team of specialists can work with your child through the early years, and support your family by providing tailored assistance, resources and information. Why should I use Yooralla for my child’s NDIS supports? Yooralla is a disability specialist, and has been supporting children with disability and their parents for 100 years. Yooralla is a not-for-profit organisation that provides the highest standards of customer wellbeing and safeguards. We have a wide range of services and provide flexible services tailored to suit the individual. We are also specialists in children’s early intervention supports and we provide specialist supports for people with high and complex needs. We have skilled, qualified staff and supports to meet all of your family’s needs. Yooralla has a range of supports to support you and your child in your home and in the community as well as a wide range of recreation programs, Support Coordination, respite and advice on assistive technology. We also have programs for school leavers who are looking to transition from school to employment or other activities. We know the NDIS as we have been supporting NDIS participants since the NDIS began. How can I use Yooralla for my child’s supports? Yooralla has a dedicated team of experienced specialists who work with families and children that can assist you with implementing your child’s NDIS plan. When you contact Yooralla, we will discuss what is in your child’s plan and how we can help.